Site of Irish gate to the west of the city, this was one of three gates that allowed entry through the city walls, the others being Englishgate to the south and Scotch gate to the north. Shaddon mill. Built in 1836 as a cotton mill by Peter Dixon. 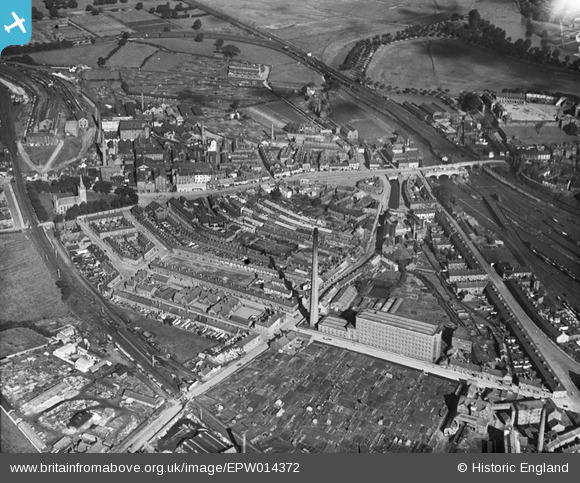 In its heyday it was the largest cotton mill in England, and the chimney (named Dixons chimney was when built the tallest in the country standing at 315ft. The mill is now residential apartments. Linton Tweeds, built 1912. One of the few textile businesses to survive in Carlisle. Linton tweed produce tweeds not just for the public, but also supply the houses of couture, and have worked with Chanel since 1924. Brewery. The brewery had its own maltings behind the brewery. It produced the beers and ales for the State management scheme, unique to the area. The scheme ran from 1916 to 1973 and came about due to the munitions factories workers during WW1 getting having to much to drink. It was decided that to control the drinking habits of the workers the brewery and pubs in Carlisle and the surrounding area would be run by the State (the government). Trinity Church. Started in September 1828, completed September 1830. The church was demolished in 1982. The Joiners Arms. Built in the middle of the eighteenth century, this is one of the oldest surviving pubs in Carlisle. Having survived numerous floods (most recent 2005 and 2015) and having 2 plaques just to the right of the door showing the levels of water on these particular dates. Still known locally as Blue Lugs amongst locals, it was ran under the State management scheme between 1916 to 1973. Carrs Bisuits (now known as McVities) still one of the major employers in Carlisle. Built by Jonathan Dodgson Carr a Quaker. He move to Caldewgate and built the factory on 1837 so he could make the most of the Canal and later the railway to bring in ingredients, the railway even had a track that ran right into the yard of the factory. Originally a flour mill, bread and biscuit bakery, in 1890 and 1900 it was extended to include no. 2 and 3 factory. It was the 1st factory in England to produce biscuits on a grand scale using production lines. Famed for the production of Carrs Water Biscuits, which were originally designed using water to bind the ingredients instead of fat so that ships (navy in particular) could have a cracker that stored for long periods at sea. Morton Street, The reading rooms for the workers of Carr's Biscuits built in late 1800's. Being Quakers the Carr's had a strong belief in education, and had the reading rooms built for their workers to read books and newspapers thus helping them with their reading skills. The building still around today is converted into a row of 4 houses, sadly the lovely garden seen set out in front is covered with tarmac. A sawmill in Carlisle is to close after 183 years. The Alexandra Sawmills Ltd on Byron Street, off Caldewgate, will shut on Wednesday with the loss of 11 jobs, the News & Star understands. The sawmill was founded in 1830 by the late Robert Creighton – a former mayor and freeman of the city – in the name of R and JR Creighton Ltd (Alexandra Steam Sawmills). It is understood that many of the current employees have worked for the firm for more than 20 years. Those who live and work in Caldewgate say they are disappointed to hear of the closure, the reasons for which are not yet known. Castle ward Labour councillor, Willie Whalen, said: “Any jobs that are lost is a disaster. I used to use the sawmill when I worked as a joiner and it was good quality timber and excellent customer service. “This is a big loss to Carlisle and it’s sad because the Caldewgate area appears to be on the up. Success was being created there but this has put a bit of a damper on it. Alexandra Sawmills was established as timber importers, merchants and slate merchants. In 1929, the sawmill and most of the surrounding buildings, including stock, were destroyed by fire and as a result of this, the third generation of the Creighton family decided to sell the business. In 1930, after 100 years of trading, the company was sold and began trading as The Alexandra Sawmills Ltd. In 2005, the timber yard, sawmill and offices were devastated by flooding, along with many other properties and businesses in the area. The business was forced to close for three months to allow a massive clean up operation. As a result of this the sawmill was totally refitted with brand new machinery and the offices refurbished. A spokeswoman for Alexandra Sawmills Ltd confirmed that the business was closing on Wednesday but no-one was available for further comment." Interesting to see that the widened bridge was only half completed. The single section nearest to the castle appears to be a temporary structure following the demolition of the original bridge. West boundary of old canal basin. Canal to/from Port Carlisle 'lived' from 1820's until 'infill≤velling' in 1850's when railway(to Silloth with branch to PortCarlisle)was laid on canal course. I attended Caldewgate School from 1940ish to 1947. My first classroom at Caldewgate junior girls school was a prefab which stood on Dans field.The school canteen was also on the site,as was the garden allotments that we children tended.This was circa 1955. This area was known as Dan's field when I was kid in the forties and into 50s. It was a great space to play, eventually Caldewgate school built an extension on it. Before that there were air raid shelters built on it which I remember being demolished. Me too derfrev.And i always wondered why it was called Dan's Field.Should have asked my Dad as he was brought up there also. Should I know you derfrev?